Published: July 26, 2013 at 11:08 a.m. Updated: July 27, 2013 at 08:11 a.m.
Kansas City Chiefs coach Andy Reid said earlier this week on NFL Network that he wasn't worried about getting No. 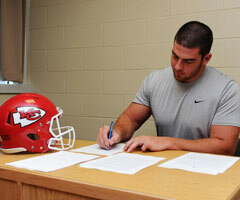 1 overall draft pick Eric Fisher under contract. Fisher was expected to be in camp by the weekend. On Friday, Reid's confidence was rewarded. NFL.com's Ian Rapoport reported that Fisher and the Chiefs agreed to terms on a four-year, fully guaranteed contract worth $22.19 million, per a source involved in the process. ProFootballTalk.com first reported the story. Fisher will receive a signing bonus of $14.518 million, with $10 million of that coming in five days, according to Rapoport. The cash-flow issue (having up-front money) was what was negotiated in exchange for having offset language in the deal. The offensive lineman will receive the rest of his signing bonus in February. Fisher has base salaries of $405,000 in 2013, $395,000 in 2014, $585,000 in 2015 and $675,000 in 2016. Fisher also has roster bonuses of about $919,000 in 2014, $1.94 million in 2015 and $2.76 million in 2016. Teams and players have very little wiggle room now to negotiate with as a result of the new collective bargaining agreement. The Central Michigan product might become the first No. 1 overall pick in NFL history to start his career at right tackle. With franchise-tag player Branden Albert on the left side, Fisher will learn how to play on the right as a rookie. UPDATE: The Chiefs made the news official Friday afternoon, announcing Fisher had signed his contract. According to The Associated Press, Fisher reported to camp, passed his conditioning test and joined his teammates on the field for the first full-squad workout.